Crowds at the Haddonfield Crafts and Fine Arts Festival. 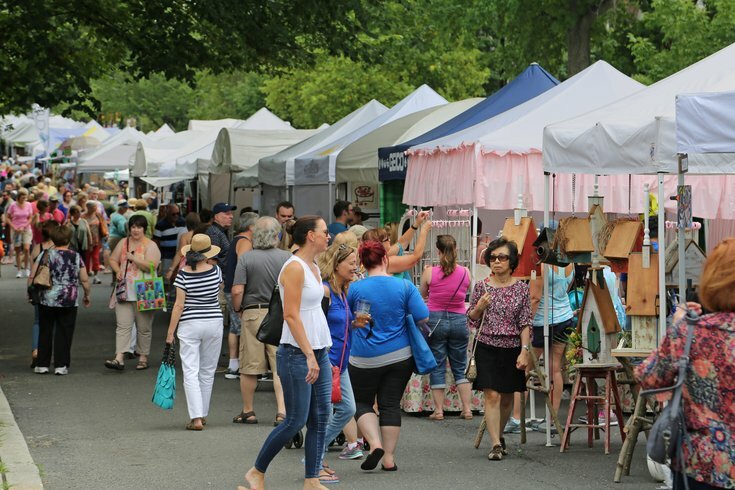 The 26th annual Haddonfield Crafts and Fine Art Festival will take place Saturday, July 7, and Sunday, July 8. More than 200 artists will sell their work at the weekend event, which is expected to draw a crowd of 100,000 or more. Shoppers can browse ceramics, jewelry, wood works, paintings, photography and more crafts and artwork. The festival will run from 11 a.m. to 7 p.m. on Saturday, and from noon to 5 p.m. on Sunday. Booths will be lined along Kings Highway, between Washington Avenue and Haddon Avenue, and along Tanner Street to Euclid Avenue. Admission and parking are both free. The event will take place rain or shine.